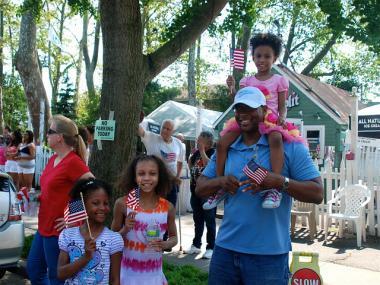 Families watch the Memorial Day parade on City Island on May 28, 2012. NEW YORK CITY — It's a great advantage of living in New York City, but not needing to own a car can also be a hindrance for daytippers looking to escape the steamy summer streets. So, to help readers skip the city without wheels, DNAinfo New York has researched some great destinations for either day trips or weekend getaways that are accessible by public transportation. With the popularity of farm-to-table eating in the New York City foodie scene, why not spend a day checking out where some of those local greens are grown? Stone Barns is an 80-acre farm and education center located just 25 miles north of Manhattan in Pocantico Hills. You can spend the day visiting their gardens and pastures and even help out with some of the day-to-day farm chores such as collecting eggs ($10 adults and children) or learning how livestock is raised ($12 adults, $10 children). There is also a farmer's market at the barns on Friday, Saturday and Sunday from 1-4 p.m. where you can buy their fresh meat, eggs and produce. To get there you can take Metro-North to Tarrytown for just under an hour ($9 one-way, off-peak). From the station you can take a taxi for about $10 one-way. The barns are open Wednesday through Sunday from 10 a.m. to 5 p.m. While not technically leaving town, City Island feels more like a quaint New England town than a Bronx neighborhood. Johnny's Famous Reef Restaurant has lots of outdoor seating where you can enjoy fried seafood and watch the boats go by on the Long Island Sound. The restaurant is located at the southern tip of the island. Just take the Bx29 down City Island Avenue to the end of the line. If you need to cool down, head to Lickety Split for some ice cream. They have soft serve, gelato, sorbet, Italian ices and tub ice cream. For the New England fishing experience you can charter a boat from Island Current Fleet. An eight-hour trip fishing for a catch such as jumbo porgies costs $65, according to its website. Rods, reels, clams (for bait) and tackle are included in the price. To get to City Island take the 6 train to Pelham Bay Park, then catch the Bx 29 across City Island Bridge. The Dia Beacon modern art museum is just an 80 minute ride from Grand Central Terminal on the Metro-North. The museum, housed in a former Nabisco cookie factory along the Hudson, has more than 240,000 square feet of exhibition space in an open and airy space. The collection focuses on art from the 1960s to present with fine art and multimedia exhibitions. Current exhibitions include a selection of wall drawings selected personally by influential minimalist artist Sol LeWitt from his work done in the 1960s through to the mid-70s. Metro-North offers a package deal, including train tickets and museum entrance, from Grand Central or 125th Street for $31.50 for adults, children 12-18 for $29.50 and children 5-11 cost $1.50. The museum is open during the summer from Thursday through Monday between 11 a.m. and 6 p.m. Located just under 90 minutes north of the city, Storm King Art Center has 500 hundred acres of land with 100 sculptures by some of the 20th century's most famous artists, such as Roy Lichtenstein and Alexander Calder. You can pack a picnic and sit on one of the center's vast lawns, underneath the sleepy Hudson Highlands and giant metal-beam sculptures. Tours are given daily at 2 p.m., but on Sundays during the summer they are at 1 p.m.
Coach USA offers a tour-package to the art center Wednesday through Sunday departing from the Port Authority in Midtown. The bus leaves at 10 a.m., getting to Storm King at 11:25 a.m. It departs the center at 5:02 p.m. and arrives back at the city at 6:12 p.m. Round trip tickets are $45 for adults and $22.50 for children 5-11. Coach USA also offers a package to Bear Mountain, located about 20 miles south of Storm King. The state park has hiking and biking trails, river fishing, boat rentals and a zoo with wildlife native to New York State. Hike up to the top of the mountain to find the Perkins Memorial Tower, which you can climb for expansive views of the Hudson Valley. The park also has a merry-go-round for kids, with 42 hand-carved seats featuring native animals. And if you want to stay overnight, check out the Bear Mountain Inn, which is located at the base of the mountain and has 15 suites. It's hard to get a room during the weekend in high season, but you can find availability during the week starting from about $150 per night, according to its website. The bus to Bear Mountain leaves the city daily from Port Authority at 8:45 a.m. or 11:15 a.m. Buses leave the mountain at 3:19 p.m. and 5 p.m. Round trip tickets are $26.70 for adults and $13.75 for children ages 5-11. You don't need to fly to California to do some wine tasting, and needless to say it's an activity best enjoyed without having to drive home. The Long Island Rail Road offers a package deal to some Long Island North Fork vineyards. A round-trip, off-peak ticket from Penn Station to Ronkonkoma costs $34, which includes vouchers for bus company North Fork Express to get you to some vineyards, including Baiting Hollow Farm Vineyard. Baiting Hollow is offering 10 percent off wines in their tasting house for L.I.R.R. riders on select Saturdays, as well as live music and food such as "Merlot Jelly" ($9.99 per jar) and "Merlot meatballs" ($8.99 for a big serving). They also rescue horses that were set to be put down. You can visit the animals in the paddocks where they graze. Check out the L.I.R.R. website for their live music schedule and package information. And if your taste runs to something stronger, Long Island Vodka is located next door to the vineyard. If you're looking for more of party atmosphere you can check out the Jersey beach and Asbury Park's Paramount Theatre where Bruce Springsteen recorded his early seminal live album. Asbury Park, like Coney Island, is a once grand boardwalk that is being rejuvenated after years of decline. The Boss cut his teeth at the Stone Pony, a beach bar on Ocean Avenue that still boasts an eclectic mix of musicians — from indie rock legends Built to Spill to all-girls Guns 'n' Roses cover band Guns 'n' Hoses — rolling through. Check out their schedule. If you or your child is a pinball wizard you can check out the Silverball Museum Arcade. The arcade has 200 vintage machines you can play. You can get a one hour pass for $10 or unlimited one for $20. There's also a free playground on the beach and a paid water park on the boardwalk. For more genteel environs, head south on the boardwalk on to the next town and you are in family friendly Ocean Grove, with the highest concentration of Victorian homes in America, according to the town's website. You can take a tour of some of Ocean Grove's historic homes on the third Friday of each July. The self-guided walking tour gives you access to Victorian homes, bed and breakfasts, the Great Auditorium and Centennial Cottage. Tickets are $25 in advance and $30 on the day. To get to either town you can take an off-peak train with New Jersey Transit from Penn Station to Asbury Park for $15 one-way for adults and $6.75 for children 5-11. The ride takes just under two hours. For many years it was the laid-back, blue collar alternative to the Hamptons, however more recently Montauk has been "discovered" and is, much to the chagrin of many locals, seeing an encroachment of Hamptons culture. Despite the proximity to its tony neighbors, there are still great deals to be found in Montauk, amazing seafood to enjoy and some of the best surfing on the East Coast. A one-way, off-peak Long Island Rail Road ticket to Montauk costs $18.25 from Penn Station, or you can take the train from Jamaica in Queens or Atlantic Terminal in Brooklyn. The ride takes a little more than three hours from Penn. Montauk, compared with the Hamptons, also has some more affordable lodging options. Sole East Beach is just across the street from the beach in the heart of town. The modern rooms come with a flat screen TV and high-speed Internet. And they provide beach towels. Also across the street from Sole is the Sloppy Tuna, a beach bar with fresh seafood and $10 margaritas. Located just two miles from the town's center, with the East Deck Motel located at the far end, Ditch Plains' rugged coastline and good surf break make it seem more like a California beach. You can rent bikes in town at the Montauk Bike Shop (from $39.99 for the day) to get there or simply walk along the beach until you see the surfers. There is also swimming at the beach and a refreshment stand serving cold drinks and some decent snacks.